is no sound on omap4. This is actually a known issue with natty, just filing a bug for tracking purposes. Patches needed for alsa-lib (UCM) and possibly Pulseaudio. Is there an E for this patchset anywhere? I know this is hardware enablement, but a lot of alsa and pulse code is being added/modified in this series of patches, such that I don't feel comfortable putting it in wholesale without release teamn approval. I was asked today to make a review of the current PA patches for UCM. need to take all precautions possible to avoid regressions. configuration to PA profile mapping, and jack detection. module-udev-detect to enable jack detection explicitly. I was asked today to make a review of the current PA patches for UCM. I've been told that for omap4, sound is currently dysfunctional and these patches help. For all others, no added functionality and so we need to take all precautions possible to avoid regressions. Seems like there are two distinct parts of functionality added, the UCM configuration to PA profile mapping, and jack detection. This seems relatively safe from regressions: the only thing that is now called for all cards is snd_use_case_mgr_open. It would be preferable if this was proactively selected, e g through a udev rule or through a module parameter passed on through module-udev-detect to the alsa card module. All other usages of ucm functions are never called if snd_use_case_mgr_open returns false. - It would be great if all the new ucm functionality was in a separate pair of .c and .h files. That would make it easier for us to pick up patches to the alsa-card.c file from upstream. I also believe upstream would appreciate that separation. - pa_log is used extensively, should be pa_log_debug, pa_log_info to avoid annoying syslog messages. For the jack detection code, that's currently not finished. The current code doesn't add anything of value to the end user, so my recommendation is not to merge it at this point. Margarita is working on a new version but it is not finished yet. Anyway, that part is more invasive to current code and so if we decide to merge it I strongly recommend to keep it disabled by default and make a module parameter to module-udev-detect to enable jack detection explicitly. A new update was posted to me through email a few hours ago. > udev-detect to the alsa card module. This has not changed in the version posted, comment remains. > up patches to the alsa-card.c file from upstream. I also believe upstream would appreciate that separation. > - pa_log is used extensively, should be pa_log_debug, pa_log_info to avoid annoying syslog messages. This is ok now although it seems like every pa_log has just changed to pa_log_info. It is unclear to me whether the new version adds value or not. Some things might have improved, but there is still no card matching, and there will still be calls to ucm functions even for non ucm cards. > make a module parameter to module-udev-detect to enable jack detection explicitly. This has not been considered, recommend not to take the jack detection part for now. In addition, the new version has three new patches about "namereg_fail", without any explanation as of what they would solve. Here are the patches reviewed in the last comment. You will find a package with the recommended patches applied in my PPA, http://launchpad.net/~themuso/+archive. My PPA is x86 only, so arm folks will have to role their own package, however it is important that this gets tested on x86 as well. Binaries for x86 should be available in a few hours. Tested with the new alsa-lib package and the pulse ones provided by Oliver but still unable to hear a sound. I cleaned up my alsa-state, rebooted and still no sound. 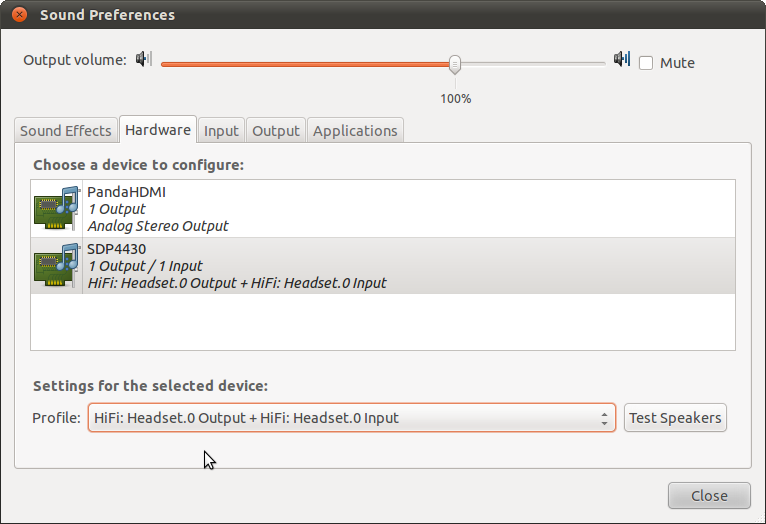 At the mixer application I can see the PandaHDMI output only, but unable to hear from hdmi. Also tried the audio jack but got nothing. I installed the arm packages at http://people.canonical.com/~ogra/natty-omap4-pulse/ onto the linaro ubuntu-desktop image and booted on a beagle C4, still no audio. (I did check the levels in alsamix, looks ok) I also booted this same image on a beagle Xm. Again no audio. Thanks for trying, but the omap4 changes are omap4 specific. You have an omap3 system. It will require some different changes, and actually should be less intrusive. See bug 651302 for the omap3 info. Still no sound on the Pandaboard. I test using speaker-test. That 'null-codec' thing just doesn't look right. @luke, i guess we are still carrying the maverick init scripts for the panda, these likely need to be removed, i suspect we have conflicts here. The name of this defect is very misleading, is this really a new feature repository for UCM for PA and Alsa? To my knowledge, PA has not accepted th UCM changes yet. Since switching to the new alsa init system, we are no longer using the big alsa init script that was used in maverick and earlier, however we are still carrying the omap4 alsa init database patch that was added in Maverick. I of course don't have the hardware to check that it still worked, so I haven't heard of any complaints with that until now. Still no sound with PPA pulse audio and latest alsa packages (which remove the init scripts). Should I clear anything? using the packages with the 4 patches included i can see the devices in the hardware tab of the sound preferences for SDP4430 i can select profiles. selecting SDP4430 and clicking on "test speakers" the sound prefs crash. going to the output tab i am only offered HDMI but not SDP4430 for output, no matter which profile is selected. @luke 0001-module-udev-detect-When-loading-module-alsa-card-use.patch seems to be missing in your build, i'm trying to add it to my testbuild for arm now. with a lot of testing we found that two simple udev rules already get SDP4430 working fine, pulse patches are not needed for having working sound. I'm wondering if a udev rule is the proper way to handle this. While it is good for an immediate fix, we should probably explore a more generic way to launch ucm at boot, as this won't fix omap3 (bug 651302). @Tobin, well, I agree in principle - if so it should be a part of (or replacement of) the volume restore script done by alsactl. At this point I kind of prefer non-invasive fixes and do "the right thing" for the next release. AFAIK we don't have ucm config files for omap3 anyway...? Actually, I am working on them today. Should have something in a few hours. Ok, still seeing some issue. The SPD4430 device doesn't show up in pulseaudio until after reboot. Will explore more as to why. May be an init thing. Apparently the udev rule for alsaucm never fires. First issue is the lack of a path for alsaucm in /lib/udev/rules.d/90-alsa-ucm.rules. Adding /usr/bin to the run lines still doesn't allow the rule to run though. Changing the alsa-utils portion of the bug back to in-progress as it contains the udev rule. It's safe to remove the old alsa state file because it's broken with Natty anyway. We should still keep the udev rule in case the user erases the alsa state file by accident, so he can still have a working sound at next reboot. If alsactl restore shouldn't be used in combination with alsaucm, it'd make more sense to combine the alsactl restore and alsaucm calls into the same udev file, calling one or the other depending on the hardware. > It's safe to remove the old alsa state file because it's broken with Natty anyway. Could you elaborate on this? Is it broken in general and for all platforms, or just for omap4? Is there a bug report? > platforms, or just for omap4? Is there a bug report? if you install todays image without the above fixes, your system will store the non working state on first shutdown. so if you ever booted a system with the original setup, you will have a broken state file that restores the broken state *after* ucm has set the defaults from the udev rule. using the udev rule alone by default instead of the state file would mean that you dont store the state at all and always force the user into using the HiFi and Record profiles after a reboot, no matter if he selected something different. Based purely on the last few comments I *suspect* that the state saving needs to be moved into Pulse so it can sync up with the UCM status that it's managing - I'd guess you'd wind up with only a small bit of state (eg, master volume) being saved, the rest of the card config should come from the UCM setup for the system. Hi everyone, my pandaboard doesn't have sound, I downloaded and update all package of the natty distribution and revised, reinstalled the alsa-base and alsa-tools, then install the package the http://people.canonical.com/~ogra/natty-omap4-pulse/ and neither work the sound. How do I get the sound system work. I am not able to record audio on pandaboard. Hardware->PandaHDMI(1 Output) and SDP4430(1 Output) . no device for Audio input. please find pointer to resolve Audio In problem. This gets audio out working for me. Audio in is still not functional, but may be driver related (I twiddled every alsamixer control and still didn't get anything). the input socket is hardwired as line-in, did you try with an mp3 player or some such (mic's dont give you a high enough level) ? recording works fine here OOTB after setting the Record verb. 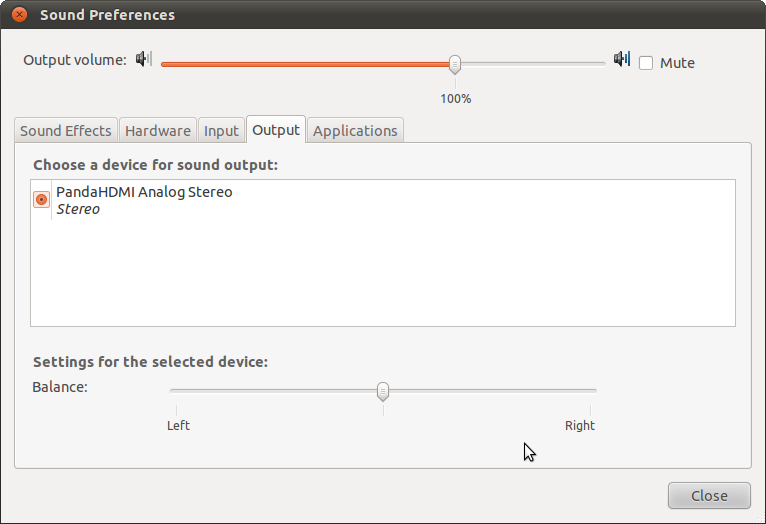 I get a workable kernel of panda from linaro landing team, and after set alsa mixer properly, the sound will play well. I update the mixer setting into alsa ucm configurations of panda. Guess Ubuntu will also be based on this tree, so this change should also happen at alsa-utils again. Feng, now we also have a PandaHDMI device, so we may need new configs for it. I will add HDMI device to HiFi use case, but it won't do any actual mixer control because there's no alsa control for HDMI card. What can it do is only provide some information about the device's PlaybackPCM. That is to say, nothing in udev rules should be configured for HDMI device, and HDMI device should be available in current ucm configuration.